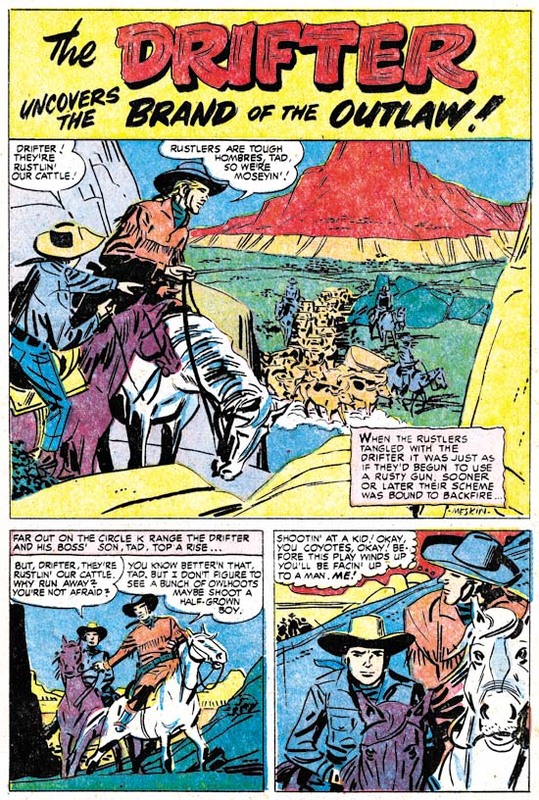 Joe Simon’s first comic book art was published in January 1940 (cover dates for Keen Detective #17, Daring Mystery #1, and Silver Streak #2). Yet just five months later he was already an editor for Fox Comics. On the face of it this was a rather dramatic rise in his career. Joe was (and still is) a talented artist but during those early days of the comic book industry there were other even more talented artists who never got further then the drawing board. Some have attributed Joe’s success to having come from a more privilege background. Joe’s family did not live in one of the boroughs of New York City but that does not mean they were well off. Most of the time the family lived in Rochester where Joe’s father, Harry, struggled to support the family. Harry was a tailor by trade but his attempts at union organizing made finding jobs difficult. At one point the family moved to Chicago into a particularly rough neighborhood. Joe tells how at age ten he was in a fight almost every day as other boys tried to take from him what little he had. (Afterwards Harry would examine Joe’s knuckles to verify that he had given a good account of himself.) No there is nothing in Joe Simon’s background to suggest he had some advantage over his contemporaries. Others have suggested that Joe’s college education was the reason for his quick career rise. 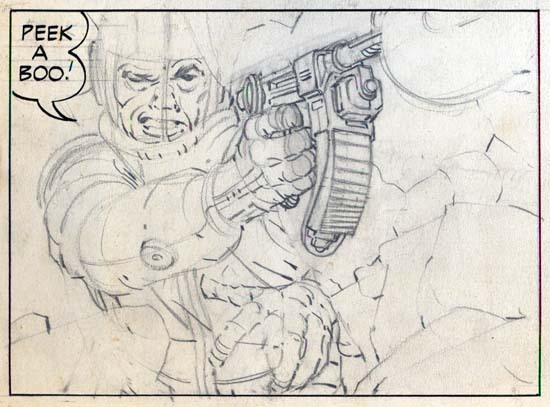 One of the originators of this idea was, of all people, Jack Kirby. Jack should have known better. Joe did not attend any college and never received a degree. Of course it was not just luck that Simon became an editor. Joe was obviously ambitious and a self promoter. One evidence of this can be seen in how Joe made sure to include his signature on much of his early art. Joe was not alone in being ambitious, other artists were as well. Will Eisner started as an artist before quickly seeing an opportunity of starting studio with Jerry Iger. Al Harvey started as an artist before becoming a publisher. But not all artists were so quick to try new opportunities. Perhaps if he had started earlier or had more money, Joe also would have tried setting up a studio but he did apply for the Fox editor position instead. Although not all artists were ambitious as Joe, there must have been some others who applied for the Fox editorial job. The other artist would likely have more experience in the comic book industry then Joe’s 5 short months. How did Joe manage to get the job? Actually the experience of most, if not all, of Joe’s possible job competitors did not amount to much. It really amounted to having spent more time drawing comic books. Being a good artist, however, really was not a necessary feature of an editor. There were other tasks that an editor would need to do such as providing layouts, putting together an entire book, or interfacing with the printer or publisher. Joe had an edge up on other applicants in some of these other tasks. Previous to entering the comic book industry, Simon spent about seven years as a newspaper staff artist. “Meanwhile”, the Milton Caniff biography by Robert C. Harvey, provides a wonderful examination of his experiences as a staff artist and I am sure Joe’s was not that much different. Yes the job consisted in providing illustrations and such for the paper, but it also doing meant doing layouts, creating decorative embellishments (dingbats) and other similar choirs. It was the experience as a staff artist for a period of seven years that Joe could use to promote himself as a good candidate for the editorial position. My thinking about Joe’s time as a staff artist was brought on by recent work that I have been doing on inventorying Joe’s personal collection. I have previously discussed some of Simon’s newspaper work. Work like sport and fiction illustrations, and political commentary cartoons. Recently I have scanned another aspect of his newspaper career, political portraits. There are 21 portraits all done on stipple board in crayon, ink and white out. Most of them are stamped on the back at the time of delivery. Unfortunately this stamp includes the day but not the year; the dates range from October 1 to 23. Some have names on the front and through the wonders of Google and the Internet I have found some of the names on a site called The Political Graveyard. Those that I have been able to identify are all politicians from Monroe County, New York. It is there fore likely that this was done while Joe was working for the Rochester Journal which according to his book, “The Comic Book Makers”, was from 1932 to 1934. The above portrait was of Acton Langslow who, according to The Political Graveyard, was a Democrat, Candidate for New York state assembly from Monroe County 1st District in 1935. The two I selected for this post were both Democrats, but there were some Republicans as well. Another has the name D’Amanda, which based on The Political Graveyard, was Francis J. D’Amanda a Democrat. Candidate for New York state assembly from Monroe County 3rd District, 1928, 1932; candidate for New York state attorney general, 1950; delegate to Democratic National Convention from New York, 1952 (alternate), 1956. The manner of execution is quite interesting. The crayon (by this term I am referring to artist crayon, not those used by children) is used in a very loose manner with distinctive individual marks by the crayon. The hair and ties are done in ink using a brush with the ties being particularly rough. 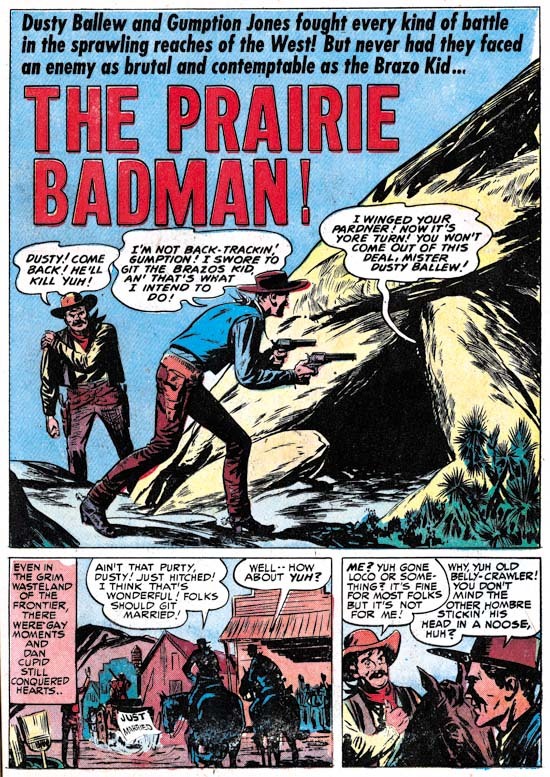 Yet when the original art is shrunk down in size, as it would have been for publication, the rough mannerisms disappear into an almost photographic representation. It was quite a performance by an artist who, if my dates are correct, was just out of high school. 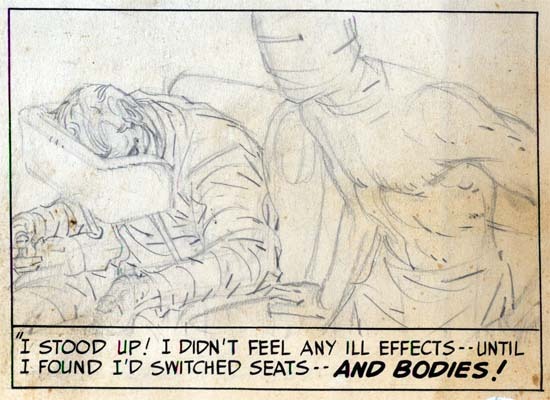 Joe Simon’s personal collection includes two large illustration boards of an unfinished syndication proposal, Tiger 21. The art on each board is composed of a long title section (empty on one of them) and three rows of panels each row nominally with four panels. They therefore were intended for use in the Sunday comics section. The work was never completed; the outlines for the panels, captions and word balloons were all inked and the lettering finished however all the pencils remain uninked. In the upper left corner of each board, outside of the actually art area, are the numbers 1 and 4 which represent the individual page numbers. This posting is by no means the first report of Simon and Kirby’s Tiger 21. John Morrow wrote an article about them in The Jack Kirby Collector #15 (April 1997). Morrow discussed six pages but the illustrations he provides indicate that he worked with copies, probably stats, of the original art. However the copies were made the process had difficulty in reproducing the pencils. John provides an outline of the story which I will not repeat here. If interested you read it in Google Books. Basically Tiger 21 is science fiction about adventures in space. There was also a concept presentation piece for Tiger 21 that was included in Kirby Unleashed and Volume 2 of the Jack Kirby Treasury has a full page reproduction (page 5), again apparently from a second generation copy, of the original art. 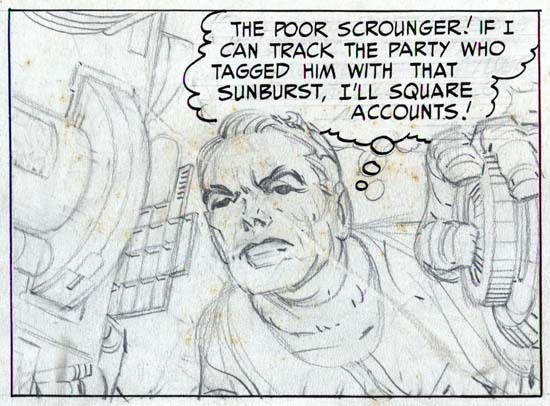 Simon and Kirby were apt to recycle syndication proposals into comic books. I previously discussed the work they did in turning the strip “Inky” into “Artist Loves Model” published in In Love #3 (December 1954). Joe and Jack also transformed a Tiger 21 story (not one of those reported in TJKC #15) into “Homecoming: Year 3000” for Fighting American #4 (October 1954). 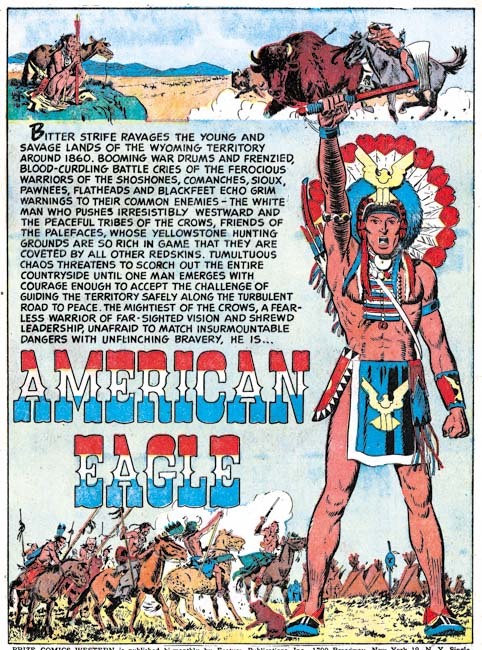 The Fighting American only appears at the start and the end while the rest of the story is given over to Tiger 21’s Starman Zero. Starman’s appearance in Fighting American was somewhat apt as the two shared a similar origin. Both involved the use of a machine to transfer the mind from one body to another. In Fighting American it was the mind from a frail body into that of his recently deceased brother. For Starman Zero it was into a synthetic body much more durable then that of a human. The artwork is quite well done in tight pencils which can be very light in certain areas. As was his practice during this period, Jack provided only lines with nothing to indicate how the spotting should be done. Cloth folds were indicated by simple lines and it was up to the inker on how to interpret them. Shadows and inking techniques were all left to the inker as well. The pencils are very bold with lots of effective use of exaggerated perspectives. 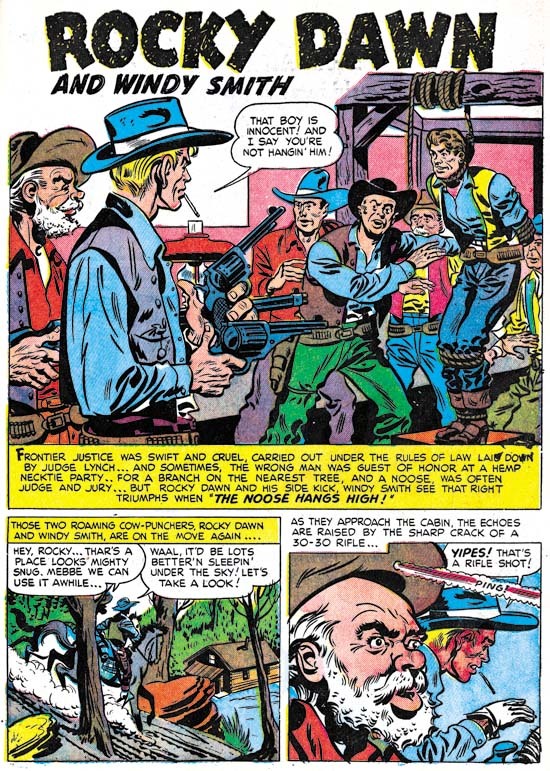 The best comparison that can be made is art that Kirby did toward the end of the Simon and Kirby studio for titles like Foxhole. This would suggest a dating to the mid ’50s. This is at odds with John Morrow’s article which assigned Tiger 21 to the late ’40s. The best way to resolve this issue would be the lettering. 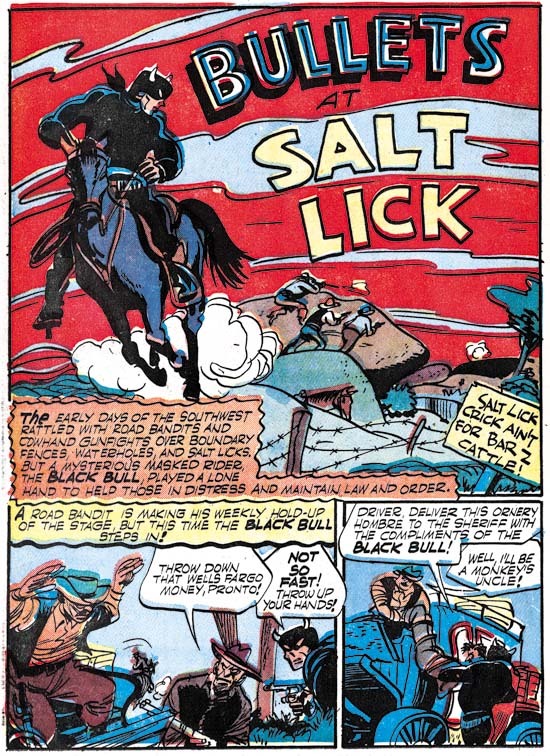 Howard Ferguson was Simon and Kirby’s first letterer while later this job was done by Ben Oda. I must admit I have not done a careful study of the lettering but that for Tiger 21 seems to match that used for Stuntman and Boy Explorers which were presumably done by Ferguson. Based just on a casual examination and therefore quite possibly in error, it seems to me that the switch of Ferguson lettering to that by Oda seemed to occur in early 1950. Therefore, admittedly with much uncertainty, a late 40’s date seems the most likely. 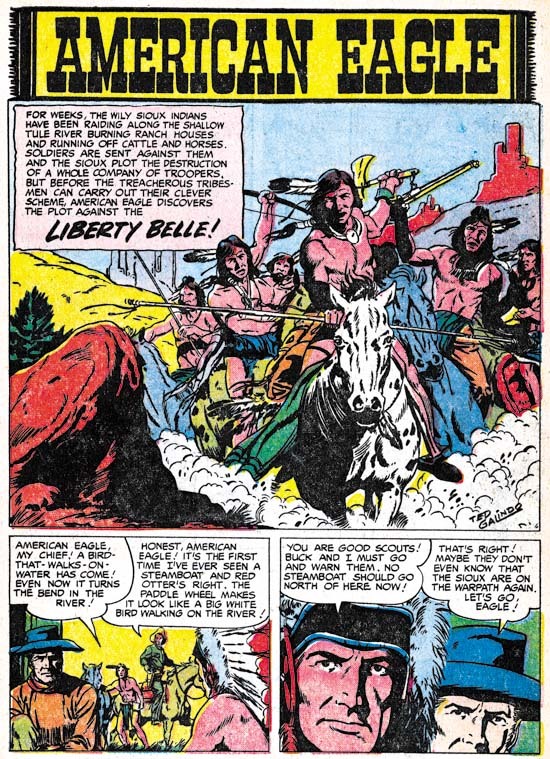 Although in his article John Morrow wrote that the title of the newspaper strip was Starman Zero, the first art page clearly shows it was actually Tiger 21. The oddly named title refers to a distant star that, in the strip, is reachable via something called the time jump. Tiger 21 was also the name of a television science fiction show that Kirby proposed to NBC in the early ’50s. For the television version, Tiger 21 was the name of the hero’s space ship. NBC eventually picked up another show instead called “Man In Space” that starred William Landigan. Recently Lawrence Genalo, Joe Genalo’s son, left a comment to my post The Lineup. 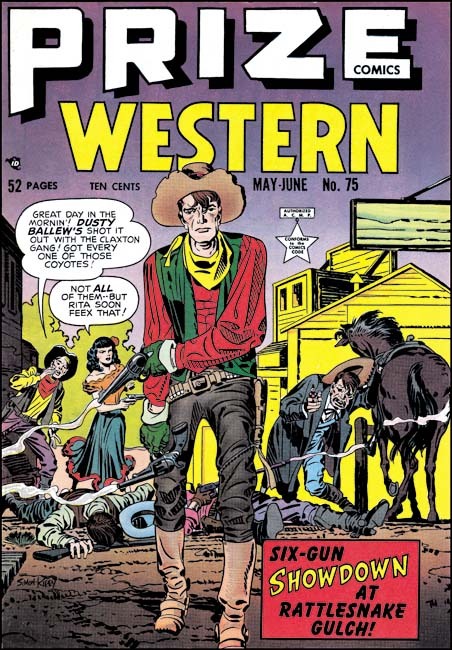 He mentioned that the center man in the lineup of the comic cover, who Joe Simon had identified as Joe Genalo, did not look like his father. I sent Larry a copy of the studio photograph (shown above) and he has verified that the man on the left is his father. Joe Genalo is shown working on a color guide. Before him are two low boxes filled with small jars, these are the dyes he is using for his coloring. 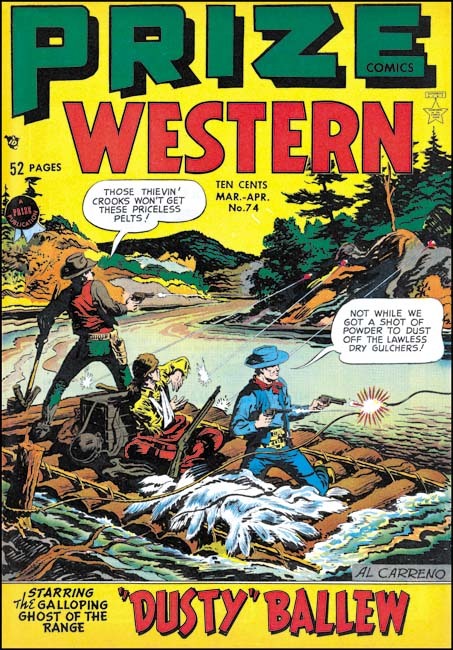 You cannot tell it from this image, but a blowup of the original photograph reveals that Genalo is working on a cover for Prize Comic Western. 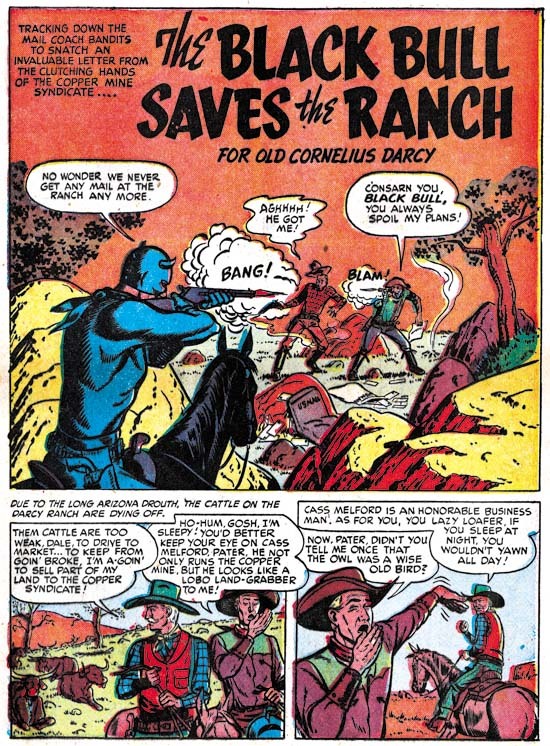 Joe Simon has told me that color guides were the responsibility of the publisher, Prize Comics. 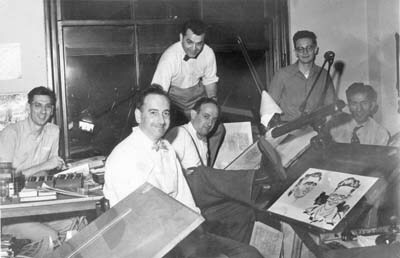 Joe Genalo was therefore being paid by Prize and although he worked in the studio (the publisher did not have their own bullpen) he did not actually work for Simon and Kirby. In a further email Larry mentioned that as a teenager, he and his older brother (also named Joe) would help color proofs that their father brought home. Please allow me a brief digression. In the photograph on Joe Simon’s drawing board are two caricatures. I am usually critical about identifications based on similar photographs, but the art looks like Simon’s work. The caricature on the right is obviously of Jimmy Infantino, but the one on the left does not match anyone in the photograph. In a recent issue of Alter Ego (#76) provided in Jim Amash’s interview of Joe Simon is a photo of Jack Kirby, Joe Simon, Bill Draut, Ben Oda and Marvin Stein. When I saw the second photograph I immediately recognized the left caricature was of Stein. I strongly suspect that the reason that Marvin did not appear in the first photograph is that he was the one taking the picture. From this I would say that Joe Genalo was the editor for all Prize comics not produced by Simon and Kirby from at least 1953 until 1960. 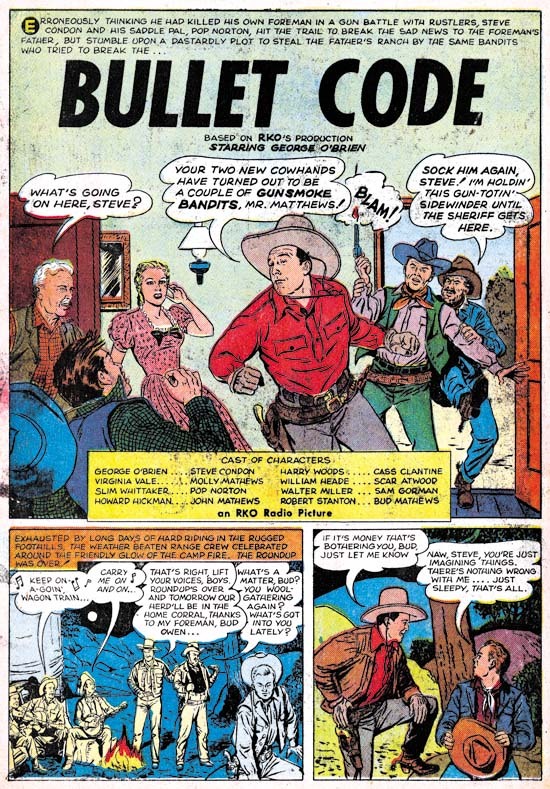 In 1960 Joe Simon returned to edit the romance comics, which were the only titles that Prize was still publishing. Genalo continued to work for Prize even after Simon’s return although I cannot say in what capacity. On a more personal level, Joe Genalo was born in Brooklyn on October 21, 1920. He was actually Joseph Genalo Jr. but is never listed as such in the comic books. When young, Joe played baseball for the Brooklyn Eagles, a semi-pro team. He was an outfielder and eventually a first baseman. Joe lived in Brooklyn until moving with his family to Levittown in 1950 and in 1958 to North Bellmore. In the 50’s he was an excellent bowler, according to his son one of the best in the New York region. Other members of the Simon and Kirby studio joined Genalo in some bowling games but none were quite as good. From his son Lawrence I learned that as a child Joe had rheumatic fever which caused two valves of his heart to be smaller then normal. Apparently Genalo did not talk about his heart problems because Simon was unaware of it until the day before Genalo left for Houston to have it operated on. His doctors were Denton Cooley and Michael DeBakey. These doctors would later become famous for their work in heart transplants, the first to be performed in the United States. Unfortunately when operating on Genalo the doctors were only aware of the problem with one of the valves. When the single valve was replaced, the other faulty valve could not take the increased pressure and it burst during the surgery. Joe Genalo died on March 15, 1963. He wife, Lorraine Mandella Genalo, lived until the age of 49 dying in 1973. They had three sons that are all still living, Joe Genalo III is now 64, Lawrence is 62 and Don is 50. Larry tells me that all are active bowlers but Don is the most successful. Don has won six national PBA titles from 1981 to 1991 and is ranked among the top 50 pros for financial success. I am grateful for the information that Joe’s son, Lawrence Genalo, has provided. It is nice to put a more human face to one of the contributors to Prize Comics. It is also rewarding to be able to identify with certainty all the people in the above photograph of the Simon and Kirby studio. Unfortunately it also means that the man in the center of Marvin Stein’s lineup cover remains to be identified.